Militant groups such as Hizb-ul-Mujahideen, Harkat-ul-Mujahideen and Al Badr operating in Jammu and Kashmir are not on Pakistan's National Counter Terrorism Authority radar. New Delhi: Pakistan is the epicentre of terrorism with a long list of outlawed organisations, including the latest to be banned Jamaat-ud-Dawa, and the country abets and aids almost half of the proscribed groups in India, according to official documents. Pakistan’s National Counter Terrorism Authority (NCTA) has so far declared 69 terrorist organisations as banned. However, it has turned a blind eye to major militant groups such as the Hizb-ul-Mujahideen, the Harkat-ul-Mujahideen and the Al Badr operating in Jammu and Kashmir, the documents state. 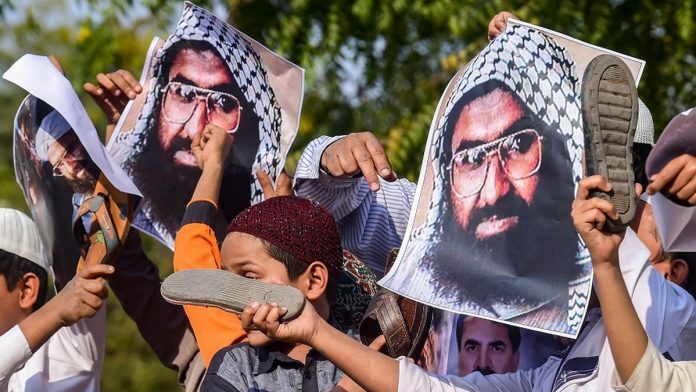 On Thursday, Pakistan banned the 2008 Mumbai attack mastermind Hafiz Saeed-led Jamat-ud-Dawa (JuD) and its charity wing Falah-e-Insaniat Foundation, amid intense global pressure to rein in the militant groups following the Pulwama terror attack that killed 40 CRPF soldiers. The JuD’s network includes 300 seminaries and schools, hospitals, a publishing house and ambulance service. The two groups have about 50,000 volunteers and hundreds of other paid workers, as per officials. According to the NCTA, a sizeable number of the organisations, declared as outlawed by Pakistan, are based in Balochistan, Gilgit-Baltistan and the Federally Administered Tribal Areas (FATA). Documents of the Indian Home Ministry state that almost half of India’s total 41 banned terrorist groups are either based in Pakistan or their leadership are based in the neighbouring country or the organisations are sponsored by Pakistan. Such groups include the Jaish-e-Mohammed, Lashkar-E-Taiba, Hizb-Ul-Mujahideen, Harkat-Ul-Mujahideen, Al Badr, Dukhtaran-E-Millat, Babbar Khalsa International, Khalistan Commando Force and International Sikh Youth Federation. The NCTA started declaring organisations as proscribed in 2001, by banning Lashkar-e-Jhangvi (LeJ). The LeJ is based in Pakistan with limited operations in Afghanistan. The Tehrik-e-Taliban Pakistan (Afghanistan), Balochistan Republican Army, Balochistan Liberation Front, Lashkar-e-Balochistan, Balochistan Liberation United Front, Tanzeem Naujawana-e-Ahle Sunnat, Gilgit, Anjuman-e- Imamia Gilgit Baltistan and Muslim Students Organization (MSO) Gilgit are among the banned organisations, as per NCTA documents. The few others are the Abdullah Azam Brigade (Lebanon, Syria and Arabian Peninsula), East Turkemenistan Islamic Movement (Turkey, Afghanistan), Islamic Movement of Uzbekistan (Uzbekistan) and Islamic Jihad Union (Uzbekistan, Afghanistan, Germany). Two groups — the Ghulaman-e-Sahaba and the Maymar Trust — have been under the scanner of the Pakistan government while another, Al-Akhtar Trust, has been declared a proscribed organisation under a UN Security Council resolution. The Hafiz Saeed-led JuD is believed to be the front organisation for the Lashkar-e-Taiba (LeT) which also is responsible for carrying out the Mumbai attack that killed 166 people. It was declared as a foreign terrorist organisation by the US in June 2014.